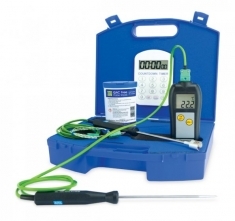 Legionnaires or Legionella thermometer kit - Incorrect water temperature is a key risk factor for legionella growth. The legionella bacteria multiply in water at temperatures between 20 to 45°C, particularly if a supply of nutrients is present, such as scale, rust, sludge or algae. A typical method of control is to store cold water below 20°C. Hot water should be stored above 60°C and distributed at above 50°C. This thermometer kit can be used to monitor the temperature of both standing water and the surface of pipes and tanks that form part of the water system. The immersion probe should be placed in the water to a minimum depth of 25mm; the ribbon surface probe may be used to take the temperature of pipes and tanks, and the wire probe can be used to reach awkward places or where the other probes are not appropriate. This kit comes with a traceable certificate of calibration. Current legislation means that if you are the employer or person in control of premises, you must organise a risk assessment. The revised Approved Code of Practice (ACOP) issued by the Government's Health and Safety Executive (HSE) significantly extends the scope of its guidance on control of legionella bacteria in water. The code now applies to all hot and cold water systems in the workplace regardless of their capacity, i.e. the lower limit of 300 litres previously used to exclude domestic systems no longer applies. Whilst domestic systems may represent a risk, the code only applies to risk arising from a work activity. This means that all employers who manage premises with hot/cold water systems and/or a wet cooling system have a legal responsibility to identify any risk of contamination and to prevent or control it. For a full specification on the Therma 1 thermometer click here!